" ज़्ब शहीद भगत सिंह, बटुकेश्वर दत्त और स्वातन्त्र्यवीर सावरकर आज़ादी की लड़ाई में जेल में थे तो क्या कांग्रेस का कोई नेता उनसे मिलने गया था ? " " When Shaheed Bhagat Singh , Batukeshvar Datta and Veer Sawarkar, greats like them were jailed fighting for the country's independence, did any Congress leaders went to meet them ? But the Congress leaders go and meet the corrupt who have been jailed. " 8.24 PM May 9, 2018.
" 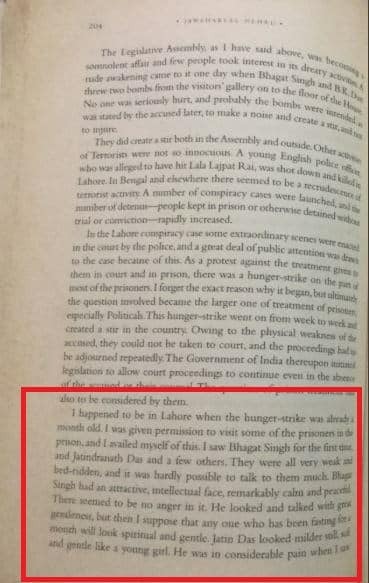 Nehru had not only met them in prision but also wrote about them. " " I happen to be in Lahore when the hunger strike is already a month old. I was given permission to visit some of the prisoners in the prison and I availed myself of this. I saw Bhagat Singh for the first time, and Jaindranath Das and few others. They were all very weak and bed ridden and it was hardly possible to talk to them much. Bhagat Singh had an attractive and intellectual face, remarkably calm and peaceful. There seem to be no anger in it. He looked and talked with great gentleness. But then I suppose that anyone who has been fasting for a month will look spiritual and gentle. Jatindas looked milder soft and gentle like a young girl. He was in a considerable pain . " 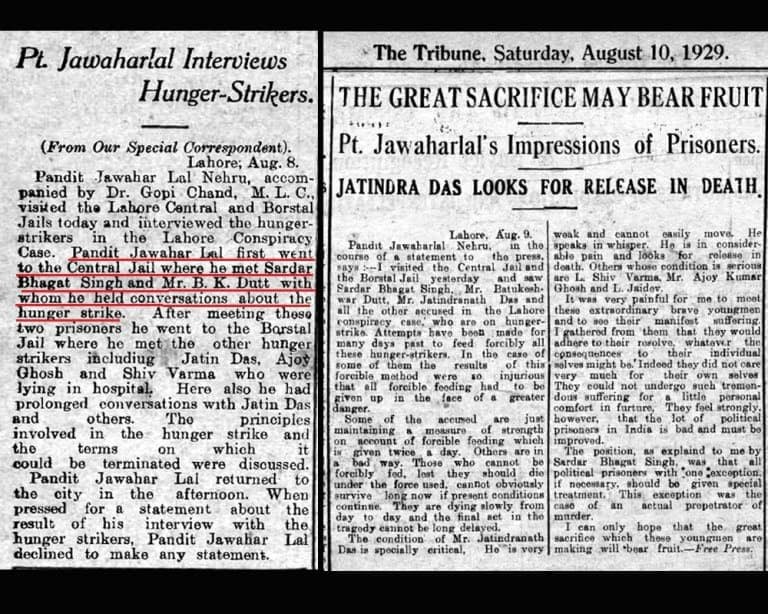 " Pt Jawaharlal interviews hunger strikers "
( पंडित जवाहरलाल ने भूख हड़ताल करने वालों से बात चीत की ).
" 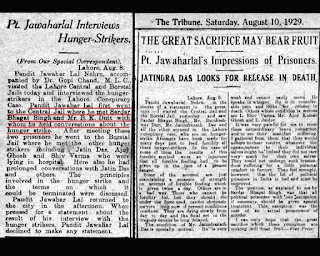 Pandit Jawaharlal first went to the central jail where he met Sardar Bhagat Singh and B.K.Dutta where he held conversation about the hunger strike. " " If the Congress Working Committee was disturbed by the terms of the settlement , many in the country were even more distressed. Under the settlement of the amnesty to the political prisoners did not include those kept in detention without trial. 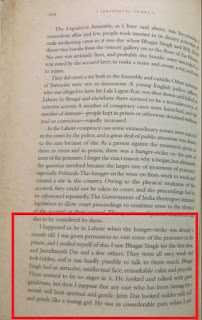 Even more contentious was the issue of the death sentence of Bhagat Singh. Public opinion demanded that it should be commuted, by the Government was adamant. On March 23 rd, despite Gandhi's desperate pleating, Bhagat Singh was executed. " " The corpse of Bhagat Singh, will stand between us and England "
" The Government dilly - dallied in implementing the recommendation of the reforms committee. 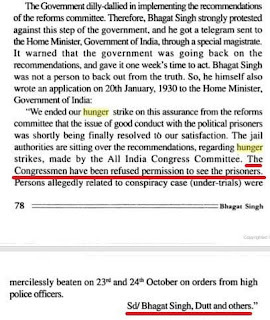 Therefore Bhagat Singh strongly protested against this step of the Government of India, through a special magistrate. It warned that the Government was going back on the recommendations , and gave it one week's time to act. Bhagat Singh was not a person to back out from the truth. So he himself also wrote an application on 20th january 1930, to the Home Minister, Government of India. " " We ended our hunger strike on this assurance of the reform committee that the issue of good conduct with the political prisnors was shortly being finally resolved to our satisfaction. 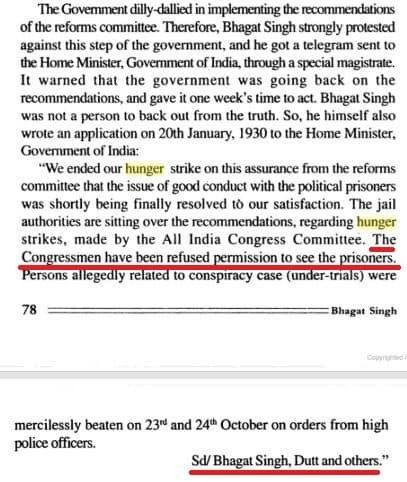 The jail authorities are sitting over the recommendations regarding hunger strikes, made by All India Congress Committee. The congressmen have been refused permission to see the prisoners persons allegedly related to conspiracy case. "